Nokia and T-Mobile announced today that the Nokia Lumia 710 will be the first Windows Phone from Nokia in the United States, arriving in January 2012. It is intended to target the nearly 150 million Americans who haven’t purchased their first smartphones yet. The Nokia Lumia 710 is capable of running on T-Mobile’s 4G network, and through this take advantage of the full social and Internet experience the phone offers, and also access popular smartphone applications and services from Windows Phone Marketplace. The Nokia Lumia 710 is expected to be available at T-Mobile retail stores, select dealers and retailers nationwide, and online at: http://www.t-mobile.com starting January 11. 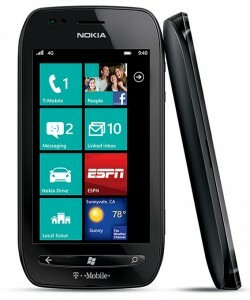 The Nokia Lumia 710 is expected to cost USD 49.99 after a USD 50 mail-in-rebate card, with a two-year service agreement and qualifying Classic voice and data plan. For more information, visit http://www.t-mobile.com/lumia. Today, people are increasingly upgrading to smartphones, and many are doing so for the first time. With an increasing demand for smartphones, the Nokia Lumia 710 could offer a compelling alternative for many of the 150 million people in the U.S. who have yet to upgrade to their first smartphones. Available in a black or white finish, the Nokia Lumia 710 features a 3.7-inch ClearBlack WVGA scratch-resistant display for outstanding outdoor viewing and a Qualcomm 1.4 GHz Snapdragon(TM) processor providing speedy access to entertainment and information on-the-go. It also features a 5-megapixel camera, enabling people to take pictures in almost any light condition and share on social networks in seconds. The Lumia 710 also includes the Windows Phone Office Hub and an interactive mobile gaming experience via Xbox LIVE®, making the Nokia Lumia 710 a great first-time smartphone experience at a good price point.